I'd imagine a vast amount of reviews of 13 Assassins have pointed out just how unlike your average Takeshi Miike film it is. For a man who has made what surely rank amongst the most explicit, provocative and controversial films of recent times, from Visitor Q to Ichi the Killer, a generally traditional samurai film is a change of pace for sure. It's a remake of a 1963 film, and from what I've heard quite a loyal one. There's a handful of typically Miike style acts of shocking violence throughout - most notably a disturbingly vivid look at a limbless victim of the film's cruel antagonist - but the bloodletting throughout is far more restrained, gritty and realistic than the fountains of crimson that have defined his more excessive flights of fancy. For a film with a body count in the hundreds (literally), this level of restraint is to be welcomed. The film opens with an act of violence which in another Miike film would have been shown in gut wrenching detail. Instead, the harakiri which kick starts the narrative occurs just off frame, the camera painfully focusing on the man's reaction as he drives his sword into his stomach. The sound effects make for painful listening, but it illustrates that Miike understands that less explicit violence can sometimes prove more effective. Anyway, the suicide is part of a complex chain of events which ultimately forces the Shogun's adviser to order the assassination of his master's cruel, disturbed and bloodthirsty half-brother Lord Naritsugu after a series of unforgivable acts of violence that threaten Japan's peacetime. A trusted samurai Shinzaemon is entrusted with the task, and then goes about gathering a small group of followers to assist in what could optimistically be referred to as a suicide mission. It sounds like Seven Samurai with small dashings of Ocean's Eleven, and often that's what it feels like. The initial setup is a bit complicated, but once you get on bored with who's who the film moves forward at an agreeable pace. It takes an hour or so to setup the politics and characters, and then breezes through a second act, and only fifteen minutes into the second act kicks into an extended, brilliant climax (more on that later). It doesn't always give us time to get a grip on the group of samurai (and one possibly supernatural tag along) bar brief backstory for two or three of the most thematically important individuals. Their setup is condensed into a speedy, entertaining training montage. It works, and it becomes clear we're firmly in action film territory, albeit one with something to say. That's the best way to look at the film, because if you're unprepared the fact that at least a third (probably more) of the film is an extended battle sequence may surprise you. And it's a brilliant decision from Miike and his crew. Seven Samurai comparisons become more appropriate as our small band samurai heroes battle Naritsugu's 200-strong entourage. It starts off like an elaborate Rube Goldberg device which is a joy to witness, only to descend into far more brutal close combat as both sides become wearier. The mud-drenched, claustrophobic streets see Miike channeling Kurosawa most obviously. It surely ranks amongst cinema's great battle scenes, culminating in a number of fumbling yet majestic duels. The body count is high, but Miike for a change reflects on death, often vocally. 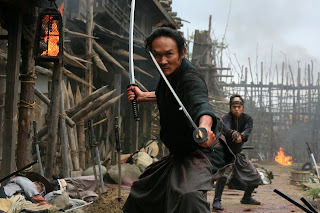 It's a great portrayal of the samurai spirit - people willing to die for their cause and mission, no matter how hopeless. The whole thing looks gorgeous, the widescreen cinematography impressing with a beautifully muted palette. It can be a bit disappointing how little attention is given to some of the assassins, but there are a number of strong performances in the mix. Yusuke Iseya provides a pleasantly light hearted performance as the strange wood dweller who joins the group, while Goro Inagaki makes a compelling villain as a man who simply enjoys brutality. Koji Yakusho's restrained performance casts him as a believable yet weary leader, and Takayuki Yamada as his nephew provides the group with that bit more depth as an individual who genuinely has something to lose apart from his life. For the most part, the thirteen assassins bring a variety of credible motivations to the story, even if only a few are granted an extended period in the limelight. I have long been a fan of Miike, and think Audition and Visitor Q (my personal favourites of what I've seen) have far more depth and individuality than their provocative content may suggest. What 13 Assassins lacks in originality and explicit Miikeisms, though, it makes up for in clarity and competence of execution. It reflects on the grizzly nature of violence, making it a welcome contrast to Miike's sometimes devil may care attitude to on screen gore. It's thoroughly entertaining once you get a grip on who everyone is: a perpetual problem in samurai movies being haircuts and costumes sometimes making it tricky to pinpoint who is who in a crowd, especially when covered in mud. I nitpick: 13 Assassins is a visceral, thoughtful action film, proving that one of Japan's most eccentric directors can handle traditional genre rather impressively indeed. After the disappointment of the awkward Sukiyaki Western Django (the last of his films to be granted a wide Western release) it's a welcome revelation.